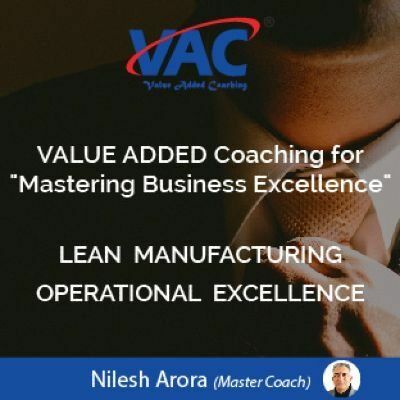 VALUE ADDED COACHING FOR "MASTERING BUSINESS EXCELLENCE"
Business Coaching and Life Coaching. Nilesh Arora, is BTech (Mech), IIM A Alumnus, Certified Corporate Director, Certified Management Consultant. He Founder Partner ADDVALUE CONSULTING INC, having nearly 20 years of experience across Asia Pacific, Africa and Middle East. He has assisted more than 500 organizations in their journey to excellence and trained more than 7500 employees in Operational excellence and Business excellence. He is a Business Coach and Mentor to several global CEOs and also counsels several family business enterprises. ADDVALUE has been recently awarded BEST PERFORMING CONSULTING ORGANISATION. Master Organisation Excellence, Design and create your own VALUE ADDING WORKBOOK during the program to create excellence in your organisation. The Course fee is inclusive of tea, snacks, lunch, training material.